The Four Best Things We Saw at the San Diego Music Box’s Mt. Joy Concert! The band premiered 2 new songs “Bug Eyes” and “Ruins.” I am not always the most excited when artists debut new songs at shows but these songs brought me to tears. Lead singer Matt Quinn’s vocals silenced the room as everyone peered onto the stage in complete admiration. I didn’t know if the band’s new music would live up to their debut album which I cherished so deeply but after they performed these songs, I know now that whatever is coming is going to be incredible. The songs mirrored the themes of the first album, topics on loss, life and nature. The band left the stage after performing one of their greatest hits, “Silver Lining.” Afterwards, the crowd didn’t budge as they begged for an encore. When the band stepped back onto the tiny stage they played another new track and then concluded with a fan favorite, “Julia.” The song is smooth, melodic and hypnotizing. A simple story of a man too nervous to order food from a beautiful waitress. While listening to this song on any streaming service, the beginning feels nearly recognizable from the whistling melody which introduces the track. Although I anticipated to see this song live, I wasn’t sure if the whistles would be apart of the performance but sure enough, Quinn whistled to the tune as perfectly as the recording. The song builds upon itself and then breaks back into a peaceful melody much like some of the band’s other songs. Lead singer Matt Quinn’s vocals were more powerful and raw than anything I have heard before. The show was filled with guitar solos and keyboard solos. Performances like these remind me why I love going to live shows. Often, I’ll see a band perform live, and while the performances are still incredible, the music doesn’t sound as great live, but with Mt. Joy that was not the case. Each song live relayed the authenticity of the songs and the stories that were told in each. The songs on the album vary from many different music styles. “Dirty Love” sounds like an upbeat ukulele tune whereas “St. George” feels like a slow ballad. The band’s ability to perfect playing these differing songs live show the full range of talent Mt.Joy encompasses. The band faces constant comparisons to Led Zeppelin’s Robert Plant and Jimmy Page causing a response of appraisal or in some cases backlash, and although there will always be critics out to say the worst, Greta’s first work was a radiant start to something beautiful. The band of brother’s first EP “From the Fires” caused a boom in the rock world landing them on lineups across the country from Coachella to Lollapalooza. They received approval from Elton John, Tom Hanks, and even Robert Plant. It is apparent when listening to the band that they are inspired by a dense vinyl collection from rock of other generations. The album begins with the feverous song, “Age of Man;” its slow start entices listeners to embark on a 10 song journey. It is the first of many layers the band created on the album. The record quickly moves towards the hard rock sound they’re known for, as songs such as “The Cold Wind” and “Lover, Leaver” show their ability to successfully pull off complex guitar solos. To juxtapose these heavier moments, rock ballads such as “Anthem” and “You’re the One” bring a sense of peace and tranquility to the album by having acoustic guitars string the songs along. The record additionally finds a middle ground between these two styles; the songs “Watching Over” and “Brave New World” utilize some eerie guitar riffs which bridges the styles into something in between. Unfortunately, the band still has some work to be done on creating a more personal and unique aspect to their music and lyrics; something bands like the Beatles, Nirvana, and Cage The Elephant have seemed to accomplish through drawing personal stories hidden beneath their epical lyricism. As it is their first full length album, in time there’s a strong possibility that they will be able to use their platform to discover their own unique sound and voice in the rock world. Rock music of the 70’s was inspired by political and social strife. Currently, we are experiencing a similar social divide among us. 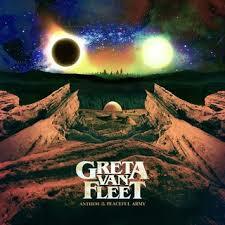 Greta Van Fleet’s desire to bring back the themes and sounds of that time only makes sense. It is about time that a band takes the risk of continuing on a sound that got lost in the future generations. The band has the potential to excel, they now just have to prove to the world they are ready to take it. Located 3 miles deep into the desert of Lake Perris, CA, Desert Daze music festival kicked off its weekend on Friday October 12. Unlike any festival I have ever been to before, Desert Daze took place on Moreno Beach making the venue one of the most beautiful places to watch live music. The psychedelic rock festival’s first day line up included Uncle Acid and the Deadbeats, Jarvis Cocker, LA Witch, and Pond, with the hotly anticipated Tame Impala headlining. While the festival had become a recent annual affair within Joshua Tree, the location was forced to move to accommodate the scope of this year’s event. Understandably, this set the stage for a series of ups, downs, and growing pains. From traffic to desert storms, here are all things we saw at Desert Daze on Friday. Lake Perris provided the festival with the most incredible scenery to look out at. Even as the storm clouds rolled in, the skyline and mountains kept visitors in awe. The main stage, where bands such as Pond and Tame Impala performed at, was enclosed around the lake and the beach, which added to every performance. Some festival-goers waited 3-4 hours in car lines on Friday simply trying to make it into the festival. While the festival experienced severe backlash from their inability to speed up traffic, they attempted to make it up by honoring all Friday passes during Saturdays performaces. Although the festival was expecting traffic at the new location, the terrible wait times many experienced added to the few losses the festival took on Friday. The festival was scattered with a plethora of interactive artwork ranging from old living rooms, a “Derpgarden”, a disco themed treehouse, spray painted murals, rainbows and so much more. With every step taken, a new piece of art was found on the grounds. The unique lively artwork added personality to the festival. Each stage had been surrounded and topped off with artistic elements boosting the live shows. Around sunset, the clouds began to darken causing some nerves within the festival goers. Who would have thought that in the middle of a Southern California desert, a thunderstorm would tarnish the most anticipated performance of the festival. A few hours before Kevin Parker, Tame Impala’s mastermind, took the stage raindrops began to fall and lightning danced in the horizon. At 10 p.m. it was fully raining but Tame Impala still began performing. After 3 songs, officials took the mic announcing in panic for everyone to exit the grounds and wait in their cars until the storm passed, promising Tame Impala would be back. Fans exited the festival upset, confused and hopeful that Tame would be rejoin the crowd at some point. My group waited silently in our car as it poured outside, getting less hopeful by each minute that passed. After an hour of waiting we decided that Tame’s return was highly unlikely and hit the road. The festival left fans without any updates during this time, besides tweeting out that everyone should seek shelter. 3 songs, 15 minutes. That is how long Desert Daze got to watch Kevin Parker dominate the stage with his trippy light shows and cosmic sound. He opened with mellow song, “Nangs” which led into a fan favorite, “Let it Happen”. Luckily for fans, Parker played the full 8 minute 9 second version of the song. Although it was only ⅓ of his performance, the energy and excitement that filled the audience during “Let it Happen” made being at that show worth it. The performance was topped with confetti and unplanned lightening taking over the sky at harmonious times with the song. Tame Impala closed off with “Sundown Syndrome” which normally would be a chill lead into an incredible setlist packed with songs from the newest album “Currents”. Although the rain stopped the show, being able to have at least seen 3 songs made the night slightly better. Kevin took to Instagram to post a sad face on a rainy window saying, “Devastated. Sorry Desert Daze. Hope everyone’s safe.” and the following day posted, “You know what’s crazy…We were planning on playing the song Jeremy’s Storm at Desert Daze for the first time in five years for a one off jam……. Still heartbroken by the way. Feel deeply for everyone who saved up to buy tickets or traveled from far away to see us. There’ll be a next time of course. Hang in there.” The irony of storm canceling the show that was to feature the rare song “Jeremy’s Storm” stings a little knowing how incredible the night would have been if it concluded with a full 90 minute Tame Impala performance. The Desert Daze music festival is budding with potential for upcoming years. While their inability to speed up the traffic lines on Friday did result in some furious people, the tragic ending to Friday was out of the festivals control. The unique line-up, breathtaking view and incredible artwork is something that makes Desert Daze unlike any festival. While the first day of the festival may have not lead the weekend off to the greatest start, many elements of the fest leave it with the ability to breakthrough as one of the best psychedelic rock festivals yet. Ever since February 7, 1964, The Beatles have been all the music world could ever talk about. Since the infamous Beatles split in 1970, the band has grown larger and larger, and yet they’ve managed to keep themselves not only relevant, but timeless in the eyes of younger generations. 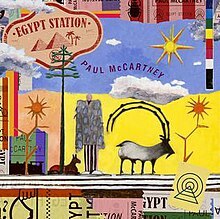 Even today, with the recent release of Paul McCartney’s new album, Egypt Station, the British Invasion continues. The new album has reached Number 1 on the charts, McCartney’s first number one in 36 years. McCartney’s album is paired with the Freshen Up World Tour, which has stops throughout the U.S. Despite the release of Egypt Station, the former Beatle is known for performing songs from both The Beatles and Wings on this tour, forcing listeners to reminisce about these wonder years. On the new album you can find his two latest singles “Fuh You,” an upbeat pop tune that sounds nothing like any of McCartney’s previous music, and “Come On To Me,” a song filled with McCartney shouts which harkens back to the nostalgia from The Beatles bowl cut beginnings. In addition to the new album, McCartney has released a Spotify Singles album Under the Staircase, complete with newly recorded songs from Abbey Road Studios. The Spotify record includes tracks like, “Love Me Do“, “We Can Work It Out“, “Nineteen Hundred and Eighty Five” “My Valentine” and more, extending fans fresh takes on Beatles, Wings and solo album hits. In addition to the upcoming tour McCartney has made stops on both The Late Late Show and The Tonight Show Staring Jimmy Fallon. On The Late Late Show, McCartney took his swing with host James Corden in Carpool Karaoke, where he stopped at his childhood home in Liverpool and surprised guests at a local tavern. Watching McCartney play along with James Corden is something that can bring a smile to anyone’s face, even my dad, who has disapproved of my Beatles obsession since the 7th grade. Overall, it’s probably McCartney’s drive to continue making new music, despite conforming slightly with contemporary pop sounds, which draws the world back into the never ending obsession and fascination with Beatlemania. Even when I was younger, I was instilled a passion for The Beatles, my Papa’s favorite band, and since then I feel as though I have seen their fan base grow larger year after year. How is it possible for a band that ended in the seventies to continue with such a large music presence, one that former members John Lennon and George Harrison disapproved of so much after the breakup? You cannot go a day in your life without seeing something about The Beatles; merchandise at a store, headlines about John and Paul, music on the radio. The Beatles came to America unaware of the impact they would have on the music industry, and it’s remarkable to think that this could continue through the rest of music’s existence. McCartney’s presence on talk shows and social media continues to lure younger audiences into learning what the Beatles were all about, while simultaneously giving them a taste of McCartney’s pure lyrical brilliance. Although the relationship between the band members was not always the greatest post-breakup, the legacy of the Beatles is one that will never die and with the success over McCartney’s new album, it is proven that Beatles fans and music lovers will listen to whatever the late Beatles releases.